Barbara Ward-Burkitt has committed almost 40 years to the Aboriginal Friendship Centre movement in B.C., at the local and provincial levels, advancing many issues that impact urban Aboriginal families. She is a proud Cree woman from Fort McKay First Nation in northern Alberta, but has lived in B.C. since she was a small child. Mrs. Ward-Burkitt’s tireless efforts to find long term solutions to homelessness have led to the development of an Aboriginal women’s housing program and Friendship Lodge which has 30 units of supported housing to address the needs of adults who are homeless or at risk of becoming homeless due to mental illnesses, physical disabilities or drug and alcohol addictions in Prince George. 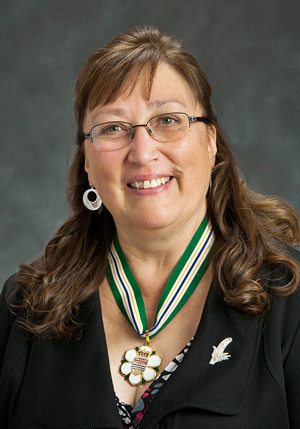 As Executive Director of the Prince George Native Friendship Centre, the largest of 120 Friendship Centres in Canada, Mrs. Ward-Burkitt acts as a strong advocate for Elders, children and families, ensuring services offered in her community focus on a holistic approach in a culturally appropriate atmosphere. Mrs. Ward-Burkitt is a committed community volunteer, serving on the Northern HIV/AIDS Task Force, the Executive Committee of the B.C. Association of Aboriginal Friendship Centres, as President of the Prince George Métis Housing Society, as well as other literary endeavours, Elder functions and cultural events. Mrs. Ward-Burkitt possesses a deep commitment to and belief in the empowerment of Aboriginal people. Her personal philosophy and strong work ethic have helped her advocate for individual and community opportunities that are life preserving and enhance personal growth, employment and education for all people regardless of race, creed, gender, age, socio/economic background or sexual orientation.